Reading over the recently posted entries at The Crew, I'm struck by how my present writing style has changed. Comparing Reese and Stephanie entries from then to my recent writing here, I see them both in my words here. With regards to Stephanie, maybe not so much the language but that's what Twitter is for. With the recent stresses, there is a comfort in the reminder they are all still part of who I am now. Stephanie's parting words of "You got this now" don't always feel true... but the evidence is there. As hard as the last 2 days were... I was able to feel and express anger. There were the bad moments, of course but later, I was able to talk about being angry without the rage part. The fear of acknowledging it was present but it was possible to state the anger and the reason in a way that made sense to those who needed to hear it. The fact we made it through without anyone doing physical harm to him or herself is a big one. The hardest part (for me) of all the anger and fear consuming me those 2 days was not impulsively tossing the overwhelming emotions into an act of self-injury just for the momentary relief. No, that wasn't the hardest part. The hardest part was hearing John's words and realizing he's very much like I was at his age. Were it not for all the electronics he hides in, he could easily be dealing with the things he refuses to talk about in the same ways I did then. And if he's me 30 years ago, then Charlie and I are my parents. The relationship and gender roles are reversed. Where Mum and I couldn't be in the same room without an argument, so it is with Charlie and John these days. And that's all I have the energy to say on that. However, I do have a post Resolutions update. I haven't made progress on everything but here's what I have worked on. - look at myself through eyes of grace. After the last couple of days, it felt like I'd taken a blow here... but there is less mental beating up of myself than there was when I wrote the resolutions. - write Clearly, sticking to this one. - begin attending open mic night each Tuesday It's the first time, but I am going tonight and have my alarm set to remind me each Tuesday. - get the boys to more young ASD meetings and generally teach them to socialize This past weekend aside, this has become our Sunday routine and the boys are enjoying it and doing well. They've also gone out on other occasions and had friends over yesterday. - sell whatever, do whatever is necessary to have the necessary exams to find out of my euterus is trying to kill me. Saw the doctor and no, my uterus is not trying to kill me. She's just a cranky old witch making my life difficult for a few more years. - make something, ridiculous, extrodinary or beautiful from found junk at least once a month. Working on a shadow box with lace and vintage keys. 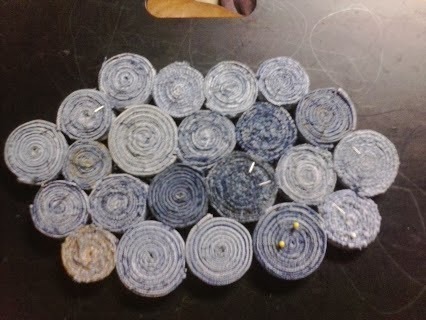 Also working on a project with denim coils. I've constructed the denim part... now brainstorming how to embellish it for a wall hanging. Denim Thing, before embellishment and with pins still holding it together. - learn welding. We haven't done this yet but now have a working torch, the braising (sp) rods and the rebar so I can make my own Bottle Tree. Thanks to Topper's Rhum, I have plenty of blue and pink bottles for the tree. - finish weaning myself off SSRI's. 3 steps over the course of 6 months to go. I'm down from 200mgs to 100. I'll step down to 50 in February then probably stay there for 3 months before dropping to 25. I hope to be anti-depressant free by end of summer. Progress is being made. That's something to celebrate. Now, Open Mic night. If I don't hurry, I'll be late.